Facebook has simplified its News Feed preferences for unfollowing people and choosing favorite friends. It's OK to like some of your Facebook friends more than others. The social network is updating its preferences to let users see more from their best friends and the family members they like -- and less from the odd cousins and obligatory business contacts they loathe. The simplified preferences are divided into four categories. In "Prioritize who to see first," you can star your besties' profiles so that their posts will always show up at the top of your news feed. Making a list of your top friends may seem very MySpace circa 2006, but it's in response to a current phenomena. "We found from surveys and talking to people that they had FOMO, the fear of missing out," said Adam Mosseri, the product manager for News Feed. Another option, called "Reconnect with people you unfollowed," lists all the people you've totally forgotten about blocking, just in case you've changed your mind about seeing their unhinged political rants or thrice-daily baby photos. The News Feed team added the option because some users felt unfollowing was too finite and negative. 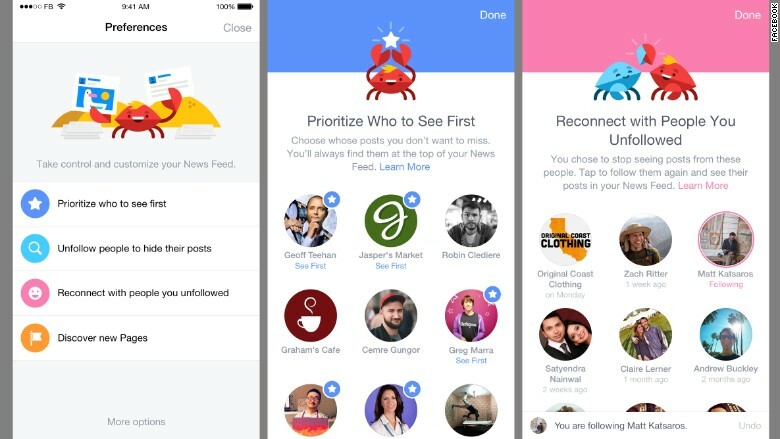 Facebook (FB) first announced new controls for the News Feed a year ago. Since then, it has conducted surveys and watched how people used the tools to find ways to improve the settings. The exact recipe for Facebook's algorithmic stew is a mystery. While these options give users a bit more control, Facebook will continue to prioritize close relationships over chronological order. It also bumps up what it thinks are important life events such as engagements and new jobs. The new preferences are only available in the iOS mobile app, but will hit Android and desktop in the next few weeks. To find them, tap the More button on the bottom of the screen and scroll down to News Feed Preferences under Settings. And for an honest look at your feed, you can always just select the "Most Recent" option.